Polaroid launches new range of budget TVs | What Hi-Fi? With a spectacular summer of sport including the World Cup and Commonwealth Games, what better time to invest in a new TV and enhance your viewing experience? There'll be no shortage of deals out there over the next few months, but if you're in the mood for a bargain, this latest announcement from Asda might just be of interest. Three new ranges of Polaroid TVs – comprising 15 models – will be exclusively available from the supermarket chain from 5th July, with prices starting from just £109. The Polaroid TV Series 1 will feature eight TVs, including a 19in set with built-in DVD player (below) with the £109 price tag and a 55in Full HD TV that'll come in at £499. Five smart TVs make up Polaroid TV Series 3, with features including built-in access to Netflix, BBC iPlayer, Twitter and more; mobile device control; and video streaming. Prices start at £139 for the 22in set, with other highlights of the range including a 40in Full HD smart model (£289) and a 50in Full HD unit (£429). And in the Polaroid TV Series 5, you'll find two 3D-enabled smart TVs that'll be available in two screen sizes – 42in (£369) and 50in (£499). You'll also get eight pairs of 3D glasses. All 15 models will be available in store and online through Asda Direct in time for such sporting events like the World Cup Final and the Commonwealth Games opening ceremony. There's no sign, however, of Polaroid's 'budget' Ultra HD 4K TVs that broke cover at this year's Consumer Electronics Show (CES) in Las Vegas earlier this year. 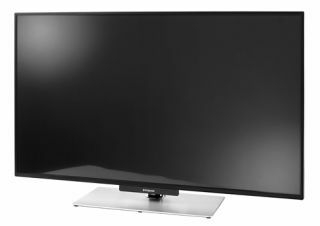 The firm showed off its 50GSR9000 Ultra HD 4K TV at the show, which is expected to retail for US$1000 (a highly affordable £607) but doesn't yet appear to have made it on sale in the UK.